I need java, but I don't want any browser to be able to access it. Is it possible to remove the whole applet/browser plugin code? This should avoid the possibility that a Java upgrade might re-enable the plug-in, which might be a risk with some other approaches. If you install the JRE; you can delete or rename npjp2.dll or libnpjp2.so (on linux); or on Linux make it non executable (chmod 0000 libnpjp2.so). This single file is the plugin file. They're located in %ProgramFiles%\jre<x>\bin\plugin2 on Windows. On Linux, they're where ever your java is installed. You can run locate libnpjp2.so to find the location. The same also applies to the JDK. This could be performed in a computer startup script. If you run this command manually, it must be done from an elevated command prompt. Starting from Oracle JDK/JRE 7u21 (Release Notes), a Server JRE is available which can serve such requirement. A new Server JRE package, with tools commonly required for server deployments but without the Java plug-in, auto-update or installer found in the regular JRE package, is available starting from this release. The Server JRE is specifically targeted for deploying Java in server environments and is available for 64-bit Solaris, Windows and Linux platforms. For more information on installing this package, see Installation Instructions. Not the answer you're looking for? Browse other questions tagged windows java mac or ask your own question. Possible to block a Java applet from writing log files? How can I restrict the java plugin to run only on certain sites in Internet Explorer? 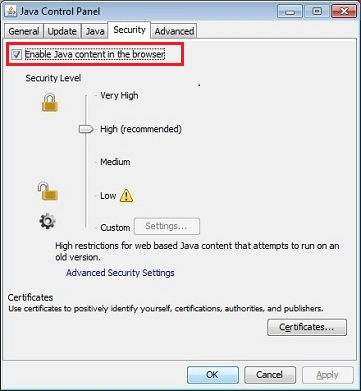 How to block the Java installer?